This tutorial explains how to use visual field mapping tool in the AutoMailMerge™ plug-in for the Adobe® Acrobat®. This tool establishes correspondence between data fields and PDF form fields for use in the mail merge process. This method is more efficient than a regular mapping method (mapping by field names) when PDF field names are long, complex or do not reflect the actual "meaning" of the field. The visual mapping tool allows to add field mapping just by double-clicking on the PDF form field and selecting an associated data field. There is no need to know the field name (for a form field) in order to establish a data mapping. The following tutorial is going to demonstrate how to produce personalized W-2 PDFs by using a mail merge operation with the help of AutoMailMerge plug-in. The CSV (comma-separated values) data file is used for the data source. This kind of files can be created by Excel and any other spreadsheet application. It is also possible to use Excel spreadsheet directly. The input file contains personal data for 5 employees: first name, last name, employee`s SSN, employee`s address and ZIP code. 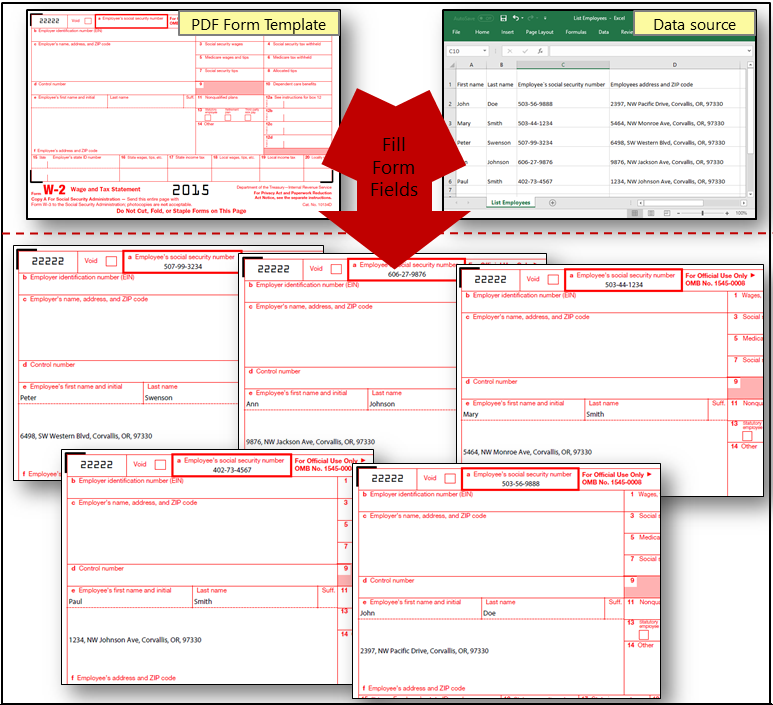 The goal is to establish correspondence between data fields and PDF form fields using a visual field mapping tool. This process is typically referred as "field mapping". The mappings are used for automatic filling of PDF form fields with data from the spreadsheet. You need a copy of the Adobe® Acrobat® Standard or Pro along with the AutoMailMerge™ plug-in installed on your computer in order to use this tutorial. You can download trial versions of both the Adobe® Acrobat® and the AutoMailMerge™. Start the Adobe® Acrobat® application and open a PDF form using “File > Open…” menu. Select "Plug-Ins > Form Tools > Map Form Fields Tool" to open the "Mail Merge Field Mappings" dialog. Select a data type to use from the list. Click "OK" once done. Choose a data file you are planning to use for the mail merge. Click "Open". Navigate to the page with the field(s) you need to add data mappings. The form fields are highlighted with the thick red border. Double-click on the form field to assign mapping to a data field(s). Select a corresponding data field in the "Select Mapping For..." dialog. Click "OK" to add selected mapping. Once the form field has been mapped to the data field it will be highlighted with the green border. Repeat the step 4 for each form field that needs to be mapped. You can review current set of mappings by clicking "View Mappings…" button. To delete an existing mapping, select it from the list and click “Delete Mapping” button. Click "OK" once done. Once all mappings are defined, press the "Save Mappings…" button. Specify a folder, a file name and save the mappings into the *.fmaps file. This file can be later used in the mail merge process. Press the “Close” button to exit the "Mail Merge Field Mapping" tool. Select "Plug-Ins > Mail Merge…" to open the "Mail Merge" dialog. Clear current settings if necessary. Press the "Edit Settings…" button. Press the "Browse…" button in the "Data Source" dialog to select the input data file. Choose the same data file that was previously used for the data mapping at the step 3. Click "Open". Now load field mappings that have been previously created by clicking "Load Mappings..." button in the "Data Source" screen. Select the *.fmaps file that contains field mappings. Click “Open”. Click "OK" once the mappings are loaded. If field mappings are matching the currently selected data file, then you should be able to see all previously defined mapings. Click "Next>" to advanced to the next step. Use the "Specify Field Options" screen to control if output form fields should remain editable or not. Check "Flatten output PDF documents" option to make form fields in output files non-editable. Click "Next>" to proceed. Use "Select Output Options" screen to control where and how to save output PDF documents. Click "Browse…" to specify an output folder. Software offers a number of different options including using data fields anywhere in the file name. Optionally, specify output and file naming options. Click "Next>" to proceed. Optionally, specify watermarking options and click "Next>" to proceed. Optionally, specify security and document access rights settings. Click "Next>" to proceed. Optionally, specify e-mail options and click "Next>" to proceed. Optionally, save mail merge settings into the *.mms file for a later use by pressing the "Save Settings" button. Use the "Load Settings" button to load settings back later. Click "OK" to finish editing mail merge settings and start the mail merge process. Optionally, click "View and Filter Data Records…" if it is necessary to run mail merge only on the subset of the data records. Otherwise, press "Run Mail Merge" button to start the actual mail merge process. Use the "View and Filter Data Records" dialog to inspect data records and specify what records should be used for the mail merge. Originally, all records from a selected data source are selected for processing. You can click on this checkbox to manually select or unselect records for processing. Each record that has a checkmark in the first column will be used in the mail merge process. All unselected records will be skipped. Use "Select Records..." button to select only a specific range of records. Press the "Run Mail Merge" button in the "Confirm Processing" dialog to start mail merge processing. The "Mail Merge Results" dialog will appear once a mail merge is completed. The dialog will list any errors that occurred during the processing. Click "OK" to close this dialog and open an output folder where generated PDF files are stored. Examine output files by opening them in the Adobe® Acrobat® and check if they satisfy project requirements.